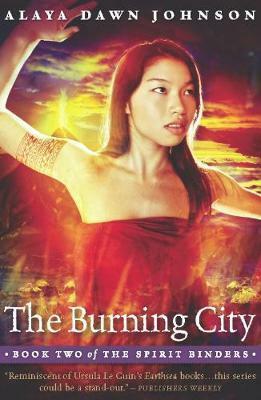 In The Burning City, Alaya Dawn Johnson continues the trilogy begun with her debut, Racing the Dark, delving deeper into the world of magic wielded by women who understand the dark trade-offs of power and sacrifice. Lana, the heroine, has become the black ange l a harbinger of destruction unheard of in the islands for 500 years. Nui'ahi, the sleeping volcano of the great city Essel, has erupted. In the chaos, the city is reshaping itself and violence threatens from all corners. A rebel movement has formed in the destroyed heart of the city, determined to oust Kohaku, the mad Mo'i of Essel. Lana wants no part of the rebels' cause the death spirit still chases her, and the great witch Akua has kidnapped Lana's mother. But the more Lana looks for her mother, the more she is drawn into the city's political conflicts. As Kohaku descends deeper into madness, determined to subdue the city by any means necessary, his wife has run away to the fire temple, where she too is slowly converted to the rebel's cause. When long-running tensions spill over into civil war, Lana must make her hardest decision yet: her mother's life, or a city's freedom?